Sir Richard Branson was born in 1950 and educated at Stowe School. It was here that he began to set up Student Magazine when he was just 16. By 17 he’d also set up Student Advisory Centre, which was a charity to help young people. In 1970 he founded Virgin as a mail order record retailer, and not long after he opened a record shop in Oxford Street, London. During 1972 a recording studio was built in Oxfordshire, and the first Virgin artist, Mike Oldfield, recorded “Tubular Bells” which was released in 1973. This album went on to sell over 5 million copies! Since then many household names, including Belinda Carlisle, Genesis, Phil Collins, Janet Jackson and The Rolling Stones have helped to make Virgin Music one of the top six record companies in the world. The equity of Virgin Music Group – record labels, music publishing, and recording studios was sold to THORN EMI in 1992 in a US$1billion deal. The Virgin Group has now expanded into international music Megastores, air travel, mobile, financial, retail, music, internet, drinks, rail, hotels and leisure, with around 400 companies worldiwde. Virgin Atlantic Airways, formed in 1984, is now the second largest British long haul international airline and operates a fleet of Boeing 747 and Airbus A340 aircraft to New York, Miami, Boston, Los Angeles, Orlando, San Francisco, Hong Kong, Johannesburg, Tokyo, Las Vegas, Delhi, Lagos, Port Harcourt, Shanghai and the Caribbean. The airline is based on the concept of offering a competitive and high quality Upper Class, Premium Economy and Economy service. The airline has won many major awards, including Airline of the Year Award several times. In 2002, the combined sales of the different Virgin holding companies exceeded £4billion. In addition to his own business activities, Richard is a trustee of several charities including the Virgin Healthcare Foundation, a leading healthcare charity which was responsible for the launch of a health education campaign relating to AIDS in 1987. The Foundation has also become involved in a lobbying campaign called Parents Against Tobacco, which aims to restrict tobacco advertising and sponsorship in sport. His help in the initial funding of charity projects helped that organisation to raise over £100 million, through campaigns such as Comic Relief and many other charities. 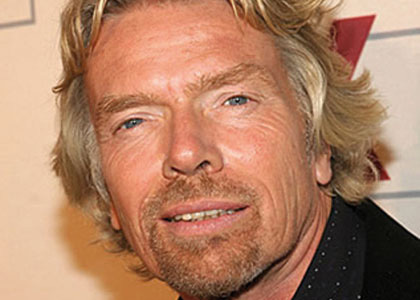 Richard Branson has been involved in a number of world record-breaking attempts since 1985. In 1986 his boat, “Virgin Atlantic Challenger II” rekindled the spirit of the Blue Riband by crossing the Atlantic Ocean in the fastest ever recorded time. This was followed a year later by the epic hot air balloon crossing of the same ocean in “Virgin Atlantic Flyer”. This was not only the first hot-air balloon to cross the Atlantic, but was the largest ever flown at 2.3 million cubic feet capacity, reaching speeds in excess of 130 miles per hour (209 km/h). Still after the ultimate adventure, in January 1991 Richard crossed the Pacific Ocean from Japan to Arctic Canada, the furthest distance of 6,700 miles. Again, he broke all existing records, with speeds of up to 245 miles -per hour in a balloon of 2.6 million cubic feet. Sir Richard’s latest entries into the Guiness World Records include being the oldest person to cross the English Channel by kiteboard and having the most followers on LinkedIn. In September 2013, he led 318 participants to set a new record for the largest number of kitesurfers to complete a one-mile course, in Hampshire. In July 2012 Branson announced plans to build an orbital space launch system, designated LauncherOne. Four commercial customers have already contracted for launches and two companies are developing standardised satellite buses optimised to the design of LauncherOne, in expectation of business opportunities created by the new smallsat launcher. John Pearson, former CEO of Virgin Radio, is an outstanding speakers on Virgin Values.